The story of THE ATTACK is told from the point of view of Amin Jaafari (Ali Suliman), a Palestinian doctor who lives and works in Israel and believes he and his wife Siham (Reymond Amsalem) are more or less assimilated into Israeli society. His world is torn apart after Siham shockingly and unexpectedly commits a suicide bombing on the very same night Doctor Jaafari is receiving an award from his peers, leaving him stunned and in disbelief. He barely has time to process what is happening before he finds himself on the receiving end of “enhanced interrogation” techniques by Israeli police. Although he is eventually let go, many of the same people who only days before were congratulating Doctor Jaafari now treat him as guilty by association. Nor for that matter is there much sympathy or understanding from the Palestinian countrymen he had left behind, even those in his and his wife's own family. Essentially a man without a country, he becomes driven to learn why his wife would commit such an act of violence and self destruction when outwardly everything seemed to be fine. Making a film that involves the Israeli/Palenstinian conflict is pretty much guaranteed to cause controversy no matter what position it takes. 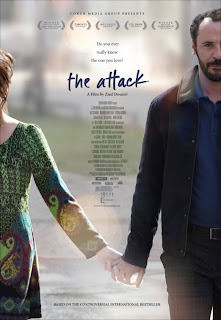 In this case, Lebanese director/co-screenwriter Ziad Doueiri seems to be taking a nuanced, shades of grey approach with enough in the way of both negative and positive to go around for everyone to provide those who wish to see it as favoring one side or the other the ammunition to do so, provided they conveniently ignore the parts that don't fit with their interpretation. Just because the film finds blame on both sides of the wall doesn't mean it necessarily has any answers to offer, though. But that's only appropriate for a film that is about how there sometimes aren't any answers, either to big political issues, or more personal ones. What THE ATTACK seems to be saying is that, like Dr. Jaafari, the best we can do is to stop pretending we already know the answers, and start looking for them with truly open eyes. 3 1/2 out of 4 stars.